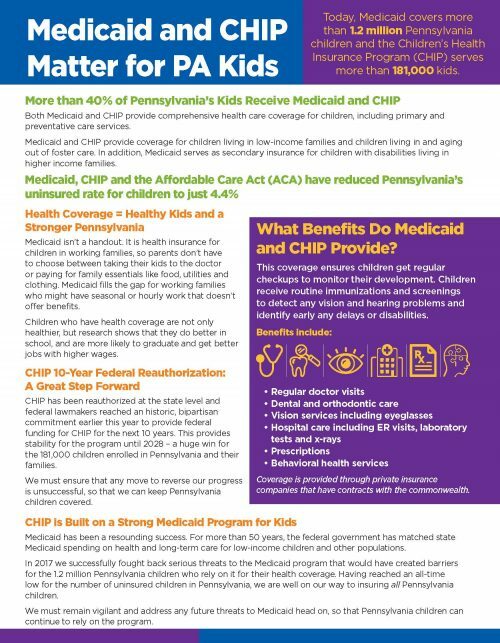 Today, Medicaid covers more than 1.2 million Pennsylvania children and the Children’s Health Insurance Program (CHIP) serves more than 181,000 kids. Medicaid and CHIP provide coverage for children living in low-income families and children living in and aging out of foster care. In addition, Medicaid serves as secondary insurance for children with disabilities living in higher income families.